Do you have an idea, a dream in your head and you don´t know how to turn it into a plan? Join our autumn training and discover your potential, resources and creativity. Decide on your first steps from a thought towards reality, with regard to nature and environment. Explore the topics of social entrepreneurship and sustainability through non-formal methods and experiental learning. 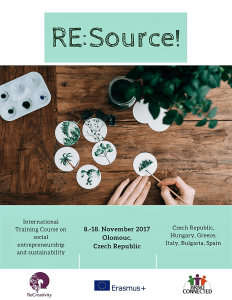 Together with Hungarian organisation ReCreativity we invite you for a nine-day training that will happen in Olomouc (CZ) and you will meet with participants from Hungary, Italy, Spain, Bulgaria and Greece. You will get an opportunity to work on your skills, knowledge and attitudes supporting you to take steps towards growing your own ideas and turning them into reality. We will explore qualities such as flexibility, creativity and innovation, and we will dive into the spirit of initiative and proactive behavior. We will approach design thinking and business planning, with a special regard to its social and environmental aspects. You will experiment with creative recycling as a tool for self-discovery and self-realisation, exploring your working style, values and goals. The whole programme is highly experiential and based on “learning by doing” approach. Expect intense days full of activities! The projects is funded through Erasmus+ programme which means that food, accomodation, programme, materials and travel costs according to the given distance bands are fully covered.